India is home to several languages while being equally diverse culturally. Often when Hindi-speaking politicians visit the southern part of India, they need a translator and many a times, the speech which gets translated literally sounds funny. One such incident happened with Congress President Rahul Gandhi in Kerala when his speech was lost in translation. 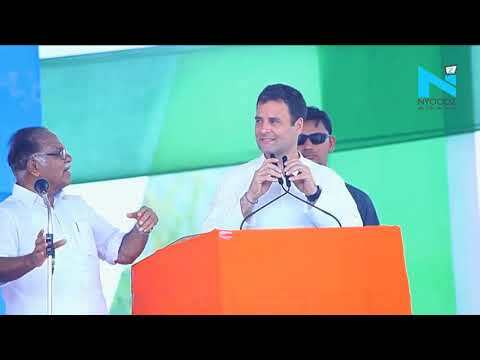 The Congress President, who is contesting from Kerala’s Wayanad along with his home turf of Amethi, has been currently campaigning in God’s own country. However, during his recent rally in Pathanamthitta, the party chief had veteran Congress leader PJ Kurien on hand to translate his words so that they reached a wider audience. But things turned humourous as many translations by Kurien were goofed-up since he was unable to hear what the Congress president was saying. For instance, when Gandhi attacked Narendra Modi and industrialist Anil Ambani, Kurien failed to hear what his party chief said, and kept asking him to repeat it so that he could translate. Troll army from the opposition was prompt to make a video capturing the hilarious moments from the stage. This is not hilarious but a bitter truth! Even the translator of Rahul Gandhi couldn't understand his words! However, many social media users tweeted and appreciated the patience of Rahul Gandhi who made the moment light and handled it with utmost respect and grace. What’s funny? That an elderly man finds it difficult to hear (clearly says there’s an “echo” problem in the sound system) & Rahul Gandhi behaves decently & patiently with him? I just had the laugh of a lifetime. But not at the cost of @RahulGandhi, big take away from this goofup is what a big golden heart RG has. See how he smiles, holds the translator's hand in all empathy. Arguably, PJ Kurien is a senior citizen and slowing of reflexes is understandable at his age. Probably the local state unit could have deputed a younger translator. Following this controversy, an old video of BJP President Amit Shah comes to light when he was campaigning during the Karnataka assembly polls last year. In the video, Amit Shah is seen losing cool at the lady interpreter after she incorrectly translated his speech in Kannada. The woman, who was tasked with translating Shah’s speech, launched into a tirade, using words like ‘Vishwaguru’ which did not find any mention in Shah’s three-second line. Mitron, mujhe Rahul Gandhi ko koi jawaab dene ka zaroorat nahi hai. Main Nelamanagala ke logon ko jawaab dene aaya hoon. Already admonished, the woman gives a very short translation. Shah then prompts her with the second half of his line – about answering only to the people of Nelamanagala. Midway through her second attempt at translation, another worker from BJP swoops in and takes over. The above two videos clearly demonstrate the behaviour of two national party presidents in a similar situation.